For Memorial Day weekend, Chris and I went to Ohio. His mother, aunt and cousin threw me a beautiful shower! It was in a private room at a restaurant. Almost all of the women in his family made it to the shower---I felt really lucky! We played games---one where they asked me to leave the room and everyone had to write down details about what I was wearing, etc. The person with the most correct details won a prize. Another game was "What's in Your Purse?" where they listed about 10 items each worth different points (birth control 10 pts, lipstick 1 pt.) The person with the highest points wins! I was pretty nervous before the shower, but after I got there, I felt great to have so many wonderful people supporting our upcoming marriage!!! I wanted to ask my girls to be my bridemaids in a unique way, so I made each girl a card with a handmade dress on the front and wrote a special note inside. The cover said "Will You..." and on the inside said "Be My Bridesmaid?" It's an inexpensive (but a little time-consuming) keepsake for the girls to hang on to! My bridesmaid dresses came in today (which I think is pretty fast, since the girls just ordered them in March!) I'm glad they came in early since that will give my newlywed---and newly prego bridesmaid, Mande plenty of time to turn her dress into a maternity one!!! The dresses are Alfred Angelo and each 'maid will be wearing a different color....fuchsia, light pink, peach, butter yellow, lt. green, sky blue and lavender!! And each groomsmen will wear a coordinating tie! So, Saturday I got fitted for my wedding gown. My dress is a big white, poufy princess gown! It weighs about 7 lbs and has a long cathedral train!! I really wanted a dress with straps, but after I got to the tailors, I took the staps down "just to see" and I fell in love with it as a strapless! So, my tailor is removing the beaded straps for me. He's also taking the dress in an inch--apparently, you're not supposed to breathe in your wedding gown!! I go in for another fitting in a few weeks! My flower girl (my 4 year-old niece, Lily) will be wearing a mini-version of my gown. She refers to it as her wedding dress and insisted on getting a pair of glass slippers to complete her look! She's going to be a riot at the ceremony! I haven't found my shoes yet.....but I have decided that they must be high! Chris is 6 feet tall and I'm only 5'3!! I also thought it would be cute idea to paint the bottom of my shoes blue. That will be my "Something Blue!" Hello! My name is Ashley and I'm getting married this summer!! 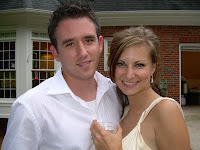 My fiance, Chris and I have been engaged since November 29th and will tie the knot July 28th, 2007. I work in the fashion industry, so it is very fitting that I met Chris when we were set up by a mutual friend to take him personal shopping. We went shopping on a Wednesday night and the next day he asked me to dinner for Friday.....and we've been together since that date!! Chris is from Ohio and I'm from Michigan, but our home is now in Atlanta, GA, which is where we've decided to have our wedding. Since our families will be traveling so far for our Big Day, we want to make sure they have a fun, memorable time! We've always wanted an outdoor wedding, so we chose Atlanta's most well-known park, Piedmont Park for our ceremony location. The ceremony will be held up the road at Atlanta's historic theatre, the Fox Theatre. We know that the venues will be memorable, but we still plan to add tons of little details to make our wedding day special! I look forward to blogging with everyone! Please feel free to email me with any questions, comments and suggestions! !